Your CMBS.com account includes the full power of an enterprise level, cloud based CRE deal modeling and sharing tool. Easily add, save and share your deal in a secure environment. 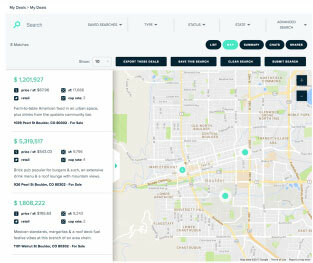 Share with our marketplace and your contacts and investors. Value your deal in minutes with our Quick-Value tool. 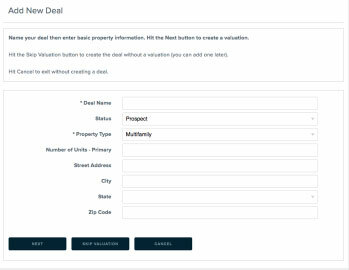 Model the asset, debt and equity of your deals using both direct cap and DCF valuation models that accommodate standardized property information. Manage property-level data that’s compliant with national reporting standards. Publish deal books that look great, are data rich, and are in a standard electronic format. Manage your deal pipeline, documents, contact and users with your online account. Search our free CMBS library to research the market and benchmark deals. Find and track leads and comps. Save money on licensing fees. Upgrade your software to the same tools the big boys use. Easily add your deals to our system with simple forms and instructions. Size your deals easily and quickly — on a single page.